Software veteran Maria Burud brings 20 years of experience in senior-level sales and marketing roles at leading technology companies. Data compiled for the ShowingTime Showing Index® reveals that homebuyer interest overall remains strong, with the South experiencing the highest year-over-year increase in showing activity for the fourth consecutive month. 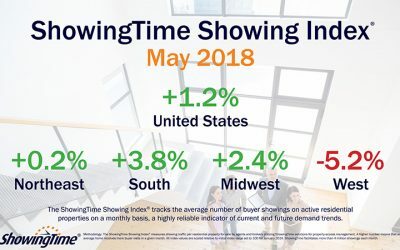 Homebuyer demand remained strong throughout the country in May as showing activity increased 1.2 percent year over year, according to the ShowingTime Showing Index®. Real estate agents using the Homesnap Pro app are scheduling over 500,000 showings a year via the Homesnap integration with ShowingTime. The ShowingTime mobile app was named one of realtors’ favorite mobile apps, according to the 2018 REALTOR® Mobile Usage Report by Realtors Property Resource®. Showing activity across the U.S. increased 4.6 percent year over year in April, according to the Showing Time Showing Index®, as buyer demand continues to rise throughout most of the country.